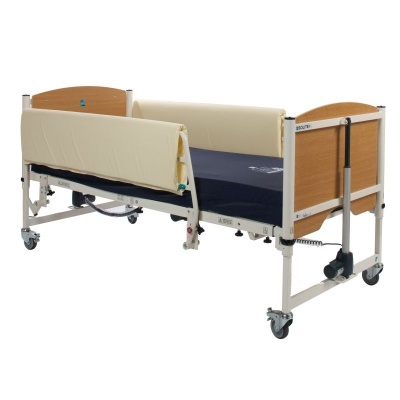 The Sidhil Universal Side Rails are an ideal solution to patient bed falls, but their hard metal construction may result in an injury risk to patients who are at risk of collisions with the rails. These Side Rail Pads are made of foam, and wrap around the side rails to cushion any potential impacts. Easily attached with Velcro, these pads are a simple and effective solution to both patient impact with rails and entrapment within them. These Side Rail Pads are available in two versions to suit either the Standard or High Universal Side Rails. Select your desired option using the drop-down menu above. Though side rails are effective at reducing falls from bed, they can introduce two new injury risks: patient impact with the rails, and patient limb entrapment within the framework of the rails. These Side Rail Pads help to reduce the likelihood of both of these injuries, covering the gap between the rails and padding their hard metal materials. Please note: Although the image above displays the Side Rail Pads in use with a pair of side rails, they are supplied on their own without side rails. Please be advised that the Sidhil Universal Side Rail Pads is usually delivered within 1 week of your order being placed. We would advise you to consider this delivery estimation before placing your order. For more information, please contact our Customer Care Team at 020 7501 0592.